AN UNIQUE HIP HOP COLLABORATION MAKES IT TO THE LIVE ARENA FOR A RARE PLAYHOUSE SHOW. "With Circle, my original intention was to use every single genre I could think of," says local DJ Boom Bip (Bryan Hollon) of his acclaimed album with former University of Cincinnati student, current rapper/lyricist extraordinaire Doseone (Adam Drucker). "I wanted a Country song on there. I wanted a something like Classical. Rock, Hip Hop, Jazz. I knew that (Doseone) was definitely capable of doing whatever with his voice. His voice is just... it's an instrument, you know." Boom Bip offered this quote recently when asked to describe Circle, a 29-track smart bomb he released last year with Doseone on Mush Records. He's right on both counts: Circle is as multi-elemental as Hip Hop gets, and Doseone is plenty capable of delivering what he dreams. And he dreams a lot. On Monday evening at Cincinnati Playhouse in the Park, Boom Bip, Why? and Doseone (who now resides in the Bay Area) will perform selections from Circle as part of alteractive, the city's newest performance series. Expect to see more experimental music aficionados and Indie rockers than Hip Hop fans in the seats around you. Circle could be described as the Last Poets and Gil Scott-Heron taking on Captain Beefheart and His Magic Band's Trout Mask Replica. It's just that Boom Bip and Doseone have a supply of skill and noise so endless, it could make Don Van Vliet and the late Frank Zappa chortle. Even those who don headphones for listening will run nonstop to keep up with this CD, as early as the second track ('the bird catcher'). Live in a theater, this should be serious fun. Doseone is just too far along before we realize he's just rhymed "shipinabottle" with "anotherboyinabubble." Not that the urban music has ignored Boom Bip and Doseone. Thomas Quinlan of Urb wrote of Circle: "Doseone impresses with yet another fantastic release, this time with electronic artist Boom Bip punching the buttons on the sampler. Dose expresses his poetic yearnings in a variety of styles over Bip's tripped-out beats, which are composed of telephone bells, fire alarms and music boxes, amongst other things ... Circle has something most albums miss: atmosphere." I made a similar comment to Boom Bip about an organic sound quality that helps unite Circle, which also racked up accolades from The New York Times, in which it was named one of the "Worthwhile Albums of 2000 Most People Missed." "The reason Circle sounds the way it does is I used the turntable to play a lot of the stuff," Bip says. "I didn't sample it, sequence it and put it out. I just played it live and recorded over top of it. If I found a horn stab, or a keyboard stab, or whatever, I just took the turntable. When it came to that point, I would just play it and record it. (Circle has) a lot of layers like that." Doseone's appearances onstage with Reflection Eternal (aka Talib Kweli and Hi-Tek) and Black Star haven't hurt his MC cred. Not so long ago, Dose (who now resides in the Bay area) also advanced to the semis of the 1997 Scribble Jam, a tournament for MCs and other Hip Hop artists held in Cincinnati. Here he battled the then-unknown Eminem/Slim Shady/Marshall Mathers. 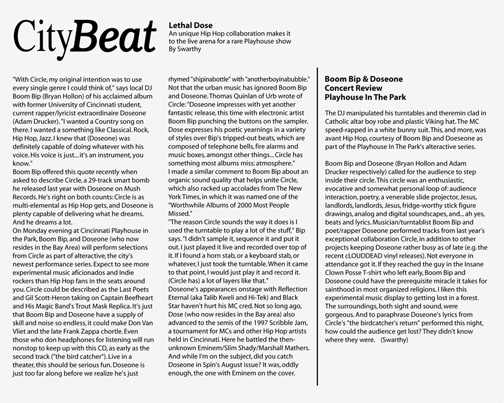 And while I'm on the subject, did you catch Doseone in Spin's August issue? It was, oddly enough, the one with Eminem on the cover. The DJ manipulated his turntables and theremin clad in Catholic altar boy robe and plastic Viking hat. The MC speed-rapped in a white bunny suit. This, and more, was avant Hip Hop, courtesy of Boom Bip and Doeseone as part of the Playhouse In The Park's alteractive series. Boom Bip and Doseone (Bryan Hollon and Adam Drucker respectively) called for the audience to step inside their circle. This circle was an enthusiastic, evocative and somewhat personal loop of: audience interaction, poetry, a venerable slide projector, Jesus, landlords, landlords, Jesus, fridge-worthy stick figure drawings, analog and digital soundscapes, and... ah yes, beats and lyrics. Musician/turntablist Boom Bip and poet/rapper Doseone performed tracks from last year's exceptional collaboration Circle, in addition to other projects keeping Doseone rather busy as of late (e.g. the recent cLOUDDEAD vinyl releases). Not everyone in attendance got it. If they reached the guy in the Insane Clown Posse T-shirt who left early, Boom Bip and Doseone could have the prerequisite miracle it takes for sainthood in most organized religions. I liken this experimental music display to getting lost in a forest. The surroundings, both sight and sound, were gorgeous. And to paraphrase Doseone's lyrics from Circle's "the birdcatcher's return" performed this night, how could the audience get lost? They didn't know where they were.